N. Hoolywood's Daisuke Obana never fails to deliver wearable menswear theatre. In the opulent surroundings of the Park Avenue Armory, a procession of rugged yet perfectly turned out gentleman climbers armed with pickaxes and rope explored the catwalk. The collection took its inspiration from a book of old photos of Yosemite National Park taken by Ansel Adams that the designer discovered at a flea market in LA. He later visited Adam's beloved Yosemite out of a desire to understand its appeal and history and was amazed to find it exactly the same as how the artist captured it. Obana was soon drawn in to the world of climbers in the early twentieth century. The designer took direct sartorial inspiration from the climbers attire. Here, just like then, their clothes were rugged yet surprisingly refined. Obana managed to strike a stunning balance between rugged outerwear and tailoring with soft tailoring. Here they wore plaid suits complete with matching zipped waistcoats, wool melton coats, hardy tweed suits with breeches buttoned just below the knee, wool houndstooth trousers with long wool socks, textured cable knits. These were climbers in their sunday best. Dazed Digital: What was the starting point for this season? Daisuke Obana: The theme for this season has its origin in a collection of photos of Yosemite National Park taken by Ansel Adams. The discovered images were beautiful. They were in black and white and inspired me to go to Yosemite for myself. I visited Adam's beloved Yosemite to help me understand the appeal and history and I was greatly inspired by what I saw. It was exactly the same as it was in the pictures. It was a long time ago but it had been untouched. DD: How did the imagery influence your designs? Daisuke Obana: I was particularly drawn to the climbers of the 1900s both in terms of their formal style and how they were able to climb with a rope and little else. During my research, I was shocked by the discovery that the climber's outfits were surprisingly formal. They were generally the same as the clothes they would wear ordinarily. For the styling of this collection I wanted to echo this, including the rope. 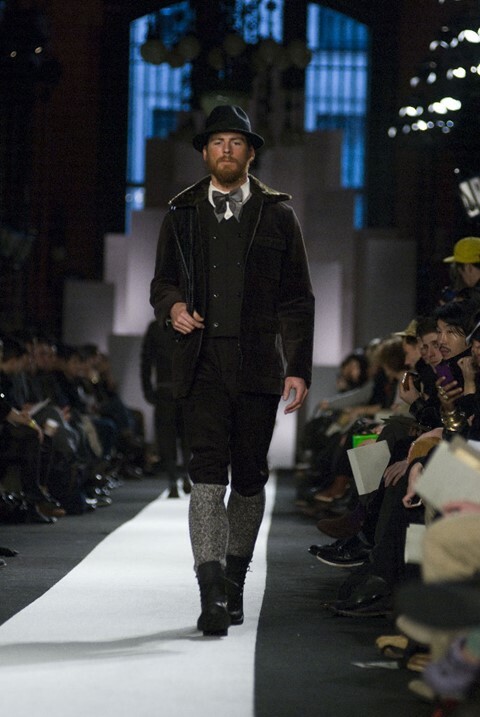 DD: There was an interesting balance between rugged outerwear and soft knitwear. Daisuke Obana: Exactly. When we think of that time, we only really think of hard, rough fabrics. Here, I wanted to focus on thickness and softness and experiment with texture. DD: The colour palette mirrored these ideas..
Daisuke Obana: Yes. I wanted to use colours that mirrored that of the landscape and earth. DD: Finally, is there a particular look that stood out to you? Daisuke Obana: I'm particularly fond of the mustard pieces.